Do you make a habit of limiting yourself regularly? You might not even be aware that you are doing it? Perhaps it’s a subconscious habit…. These are ALL examples of YOU limiting YOU! As I have mentioned on numerous occasions before, the human brain is lazy due to it being hard-wired for survival AND an energy hog, so it will ALWAYS look for ways to conserve energy and reasons NOT to do things, or NOT to change, or go outside your comfort zone…. see a pattern here….? So what can you do it you find that you are have some limiting thought processes like the examples above? 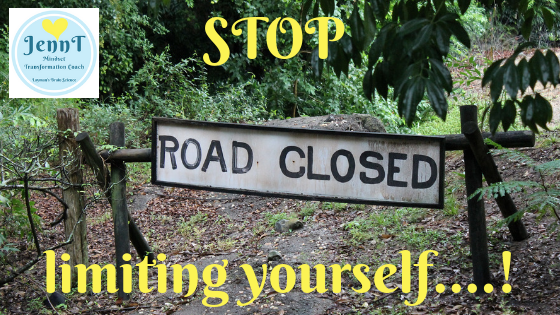 STOP limiting YOU in 3 simple steps! Think of the ‘nay-sayer’ in your mind as a separate character and give her a name. For example, I might call mine Judgy Jenn, or Jaded Jenn. 2. When you hear Judgy Jenn start speaking – STOP listening…. 3. Instead, ask Jellybean Jenn (the happy go-lucky, positive version of your mind) to step in with an alternative. Then go have an amazing weekend with your girlfriends and don’t forget to thank Jellybean Jenn when you’re having an amazing time! If you would like further guidance with overcoming unhelpful thoughts, worry, overthinking, overanalysing, please check out my coaching page. To watch the LIVE version of this blog, in YouTube click here.